After the perfection of IN THE MOOD FOR LOVE came the sequel, 2046 - a reflexive, rambling film that was ultimately a failure despite its ravishing visuals. Tony Leung reprised his role as Chow, now living in the Hong Kong of the late 1960s. He lives in a seedy hotel, next to room 2046 - a metaphor and focus for all his regrets and sexual yearnings. At the same time, he's writing a sci-fi novel set in 2046 - a place where you can relive your dreams in perpetuity. In this strange world of past, present and future, Chow meets a parade of beautiful, mysterious women, each dressed to perfection and photographed in a state of heightened beauty. If all these themes and striking images had been harnessed to empathetic characters and a proper story, Wong Kar Wai might have given his fans a film to treasure. Instead, the movie feels self-indulgent and unsatisfying. And, to paraphrase an interview with DP Christopher Doyle during a retrospective at the National Film Theatre, somewhat redundant. Wong Kar Wai said everything he needed to in IN THE MOOD FOR LOVE. 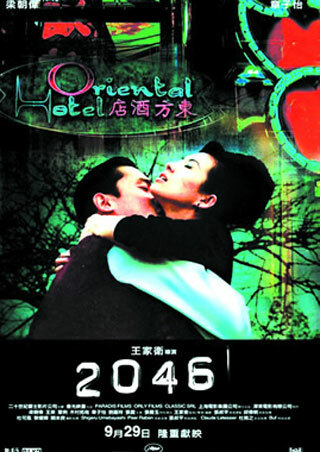 2046 played Cannes and London 2004 and is widely available on DVD.